CHILDREN OF THE CORN: NEBRASKA GETS ITS FIRST POST-FIASCO DUMP--"NO QUESTIONS ASKED"
NEBRASKA GETS ITS FIRST POST-FIASCO DUMP--"NO QUESTIONS ASKED"
This morning The Omaha World-Herald and other Nebraska media (here and here) report that the state got its first "safe haven" catch since its new and improved law went into effect late last year. The baby, described as "a male Caucasian newborn less than 30 days of age" was dropped off by a family member at the Box Butte General Hospital in Alliance Monday night. Nebraska's post-fiasco law permits designated dumpers to drop off babies 30 days and younger no questions asked. Did we say no questions asked? “It’s important to gather information like family medical history to meet this child’s current and future needs,” he said. Officials asked that anyone with information call the HHS office in Gering at 308-436-6559, the Box Butte County Sheriff’s Office at 308-762-6464, the Alliance Police Department at 308-762-4955 or the Nebraska State Patrol at 308-632-1211. What ever happened to no shame, no blame, no name? Alliance, Nebraska, population 8,959 (2000 census) is located in northwest Nebraska. 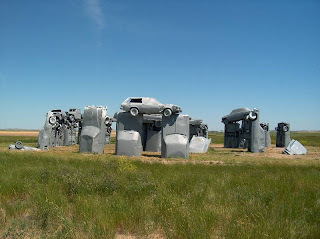 Before it became Nebraska's first post-fiasco dumping ground it was known mainly for its replica of Stonehenge constructed from automobiles. UPDATE: The HHS press release is now up. Click here.